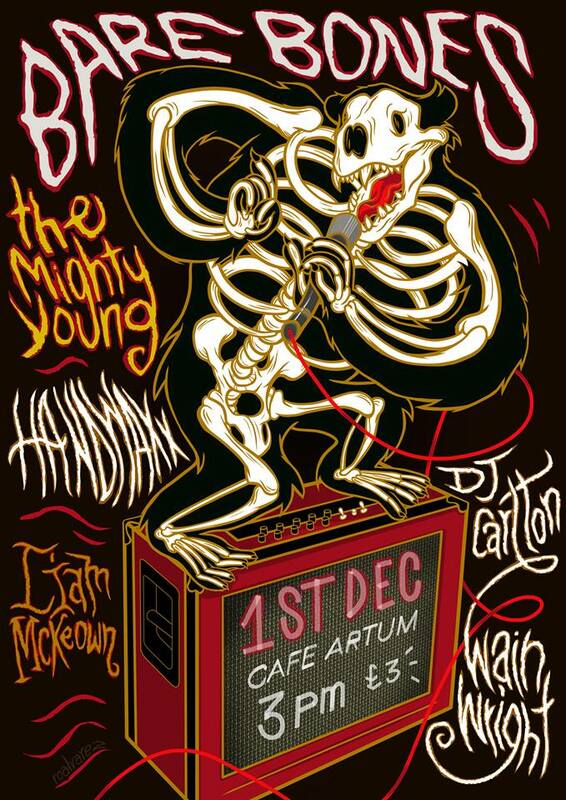 On Saturday 1st December, the inaugural Bare Bones comes to Café Artum – with acoustic sets from The Mighty Young, Handwaxx, and Liám Mckeown. The event runs from 3pm until 6pm, with three live sets alongside music from Carlton Wainwright on the wheels of steel. Or, you know, the CDs of chaos. Mix tapes of mayhem. The idiosyncrasies of an iPod shuffle…? Whatever the kids are spinning these days. What we can be sure of is Bare Bones will cost you all of £3 sterling to enter – as presented by The Whisk. Spaces will be limited at Café Artum, with advance tickets available online via Skiddle, click here. Or for more direct event information visit the Bare Bones Facebook event page, click here. Now this is a good idea… As the Bare Bones promo rhetoric states, ‘expect to see your favourite local artists perform raw, stripped back, great music with no frills’ performing in ‘a bare minimum set up and a super intimate venue’. It actually says all that the other way around, but the idea of getting some good ol’ garage rock, indie, and six stringed psychedelia played ‘stripped back’ and ‘raw’ absolutely works for – us regardless of what order the words are in. Plus it’s cheap as chips. In fact, it’s cheaper than chips – it’s cheap as a bag of potatoes and a saucepan of cooking oil that will one day become chips. And we like that too. And last but by no means least is Liám Mckeown, better known (perhaps, who knows what he does in his spare time) as the centre piece of Brain Food – Birmingham’s delectable ‘swirling psych-soaked four piece’. We like Brain Food a lot, on stage and off, and their commitment to the local music scene is a heart warming addition to the city’s cultural cache. Bare Bones presents its first afternoon of ‘stripped back’ acoustic sets at Café Artum on Saturday 1st December, running from 3pm top 6pm. For more information and links to online ticket sales, visit the Bare Bones Facebook event page – click here.